Summer is slipping through my fingers! Pumpkin spice items are already taking over the shelves, and I've only gone to the shore once! (For the record, I'm all about the pumpkin flavored stuff, but it's too soon!) 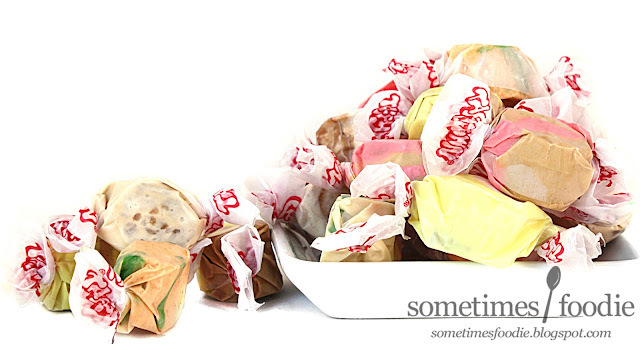 I'm currently fighting tooth and nail to pack as much summery goodness into these last few days as I can, and since I was raised here on the east coast, nothing says summer like salt water taffy. Long before Cybele and I recorded our salt water taffy themed episode of Candyology 101, she was able to go to the Sweets and Snacks Expo where she had the chance to try a chicken and waffles flavored salt water taffy, and I was super jealous. 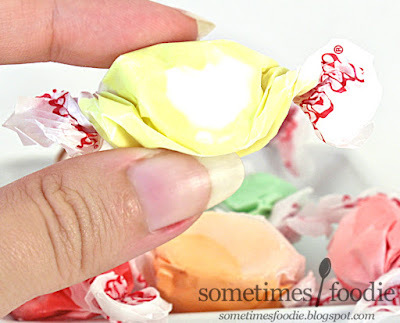 Thankfully the same taffy company, Taffy Town, ended up being at the New York Summer Fancy Food Show, and on day two I headed right to their booth hoping that this crazy chicken-y flavor was available as a sample, and it was! Along with a bunch of other neat flavors I had never had before! So I thought I'd do a quick little review of each one. 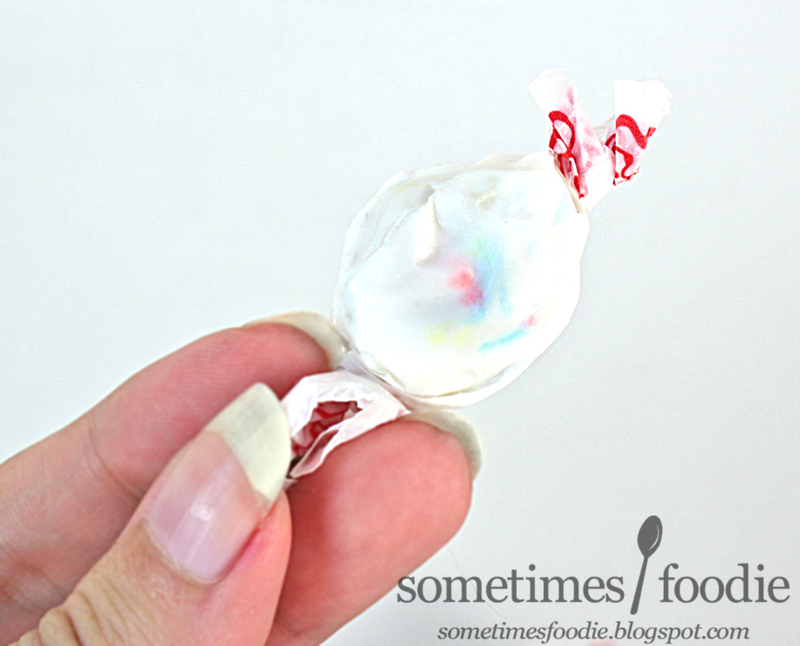 Since it's really humid, and my photo light are bright, unwrapped, all of the taffy was a sticky mess, so there are no unwrapped or bite-shots today. Let's start with the one I was waiting for, Chicken and Waffles! It's a yellow and tan taffy, and when it's unwrapped, it smells a little bit like chicken ramen, but the overall aroma is very maple syrup-heavy. That description sounds bad, but trust me, it's really not that weird. I took a bite, and the flavoring starts out a lot more subtle than you'd expect. 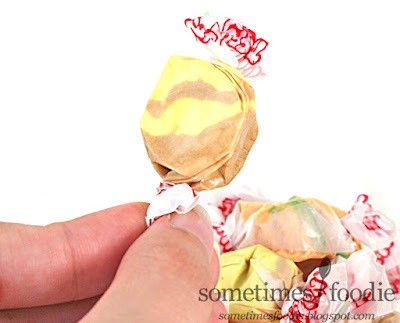 At first you get that sweet breakfast-y maple syrup flavoring, but as you chew, you get a tiny savory hint of chicken. Cybele likened it to licking a chicken bouillon cube, and I'd say she was spot on. This is a vanilla and maple flavored taffy with a tiny hint of chicken bullion, and you know what? I dig it! I grabbed 3-4 pieces of this one and I will have no trouble eating them all. The name is way more shocking than the actual flavor. Next in the weird flavor category, Maple Bacon! 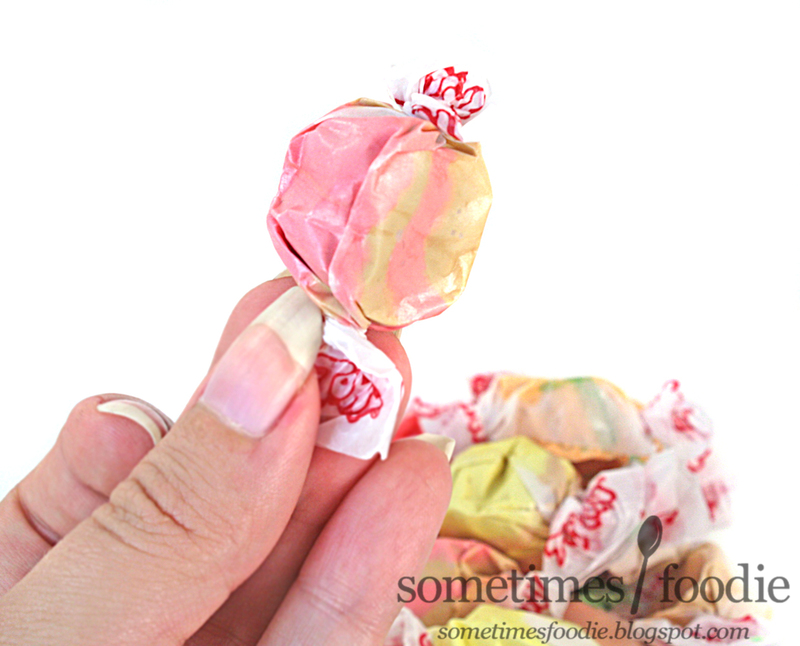 Bacon flavored taffy? Yes, please! This one has that same breakfast syrup flavoring, but this time it's a lot stronger and there's a hint of smoke with a healthy dose of salt at the end. It doesn't overdo it on the fake meaty flavoring, and I found this really snackable. I wanted to keep on unwrapping them and eating them, which is good for the company, bad for my dental bills. On a more serious note, bacon was once the king of all things foodie. Back when Epic Meal Time was the end-all-be-all of indulgent bacon-y goodness, I bet this would have sold like crazy, but sadly, bacon seems to be losing it's momentum as a trendy food item. Still, this is pretty darn good, and I could see it selling really well if people give it a chance. So they have something meaty, but what about spicy? For that, there's Chili Mango! 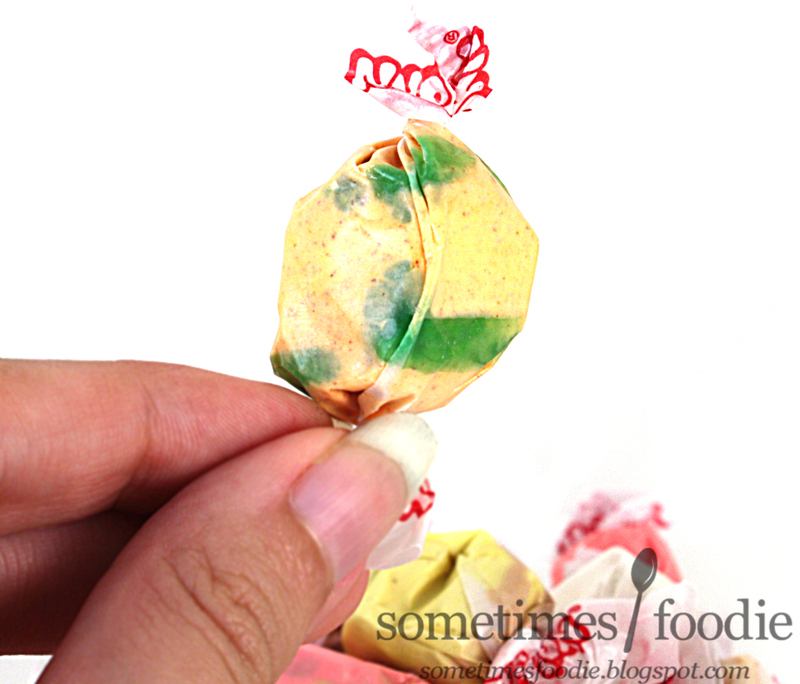 This smells just like every other chili-mango flavored candy I've ever had, so there's nothing report there. When chewed, it starts out sweet and tastes similar to Rita's mango water ice, but the heat builds up slowly. It's pretty nice. I had a few pieces of this, and it seems like the heat intensity might vary a bit from batch to batch. The first two pieces were in the mild to medium range, but the last one I ate was hot enough to hit the back of my throat and make me cough. It's pretty impressive! The normal ones were okay, and not something I would buy again, but that spicy one? I'd definitely buy more if they were like that! Next is something sweet to combat that heat. (I rhymed!) This is Frosted Cupcake. In the same vein as Frosted Cupcake is Lemon Meringue! This one is just...so good. They really nailed the meringue flavoring! It's sweet, almost marshmallow-y, and there's a lovely authentic lemon flavoring. This is just so refreshing! It may not be a fancy gimmick, like bacon or chicken and waffles, but it's damn good! I'd definitely buy a bag of just these.